What is the Deschutes River Conservancy? 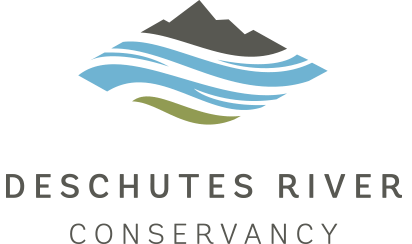 The Deschutes River Conservancy (DRC) is a 501(c)3 non-profit corporation founded in 1996. Our mission is to restore streamflow and improve water quality in the Deschutes Basin. Water management is one of the most important issues facing Central Oregon today. What are the problems that the DRC is addressing? Nearly 90% of the streamflow from the Deschutes River in Bend can be diverted through irrigation canals during the irrigation season (April - October). During the summer months, these diversions cause a dramatic reduction in streamflow. The porous, volcanic soil characteristic of this region causes as much as 50% of the water that is diverted from the river in irrigation canals to seep into the ground before it reaches the farm. As a result, irrigation districts need to divert twice the amount of water as they need to serve their patrons. These seasonal flow disruptions have contributed to a decline in the overall health of the river including degraded fish habitat and poor water quality. How does the DRC restore our local rivers and streams? The DRC employs four market-based, innovative programs to restore our local rivers and streams: the Leasing Program, Conserved Water Program, and the Transfers Program. How can water users conserve water? Water users can conserve water by either applying less water to their land or by reducing leaks in canals while transporting irrigation water. What types of conservation projects are there? There are two main categories: piping and lining canals and on-farm efficiency projects such as converting from flood irrigation to sprinkler or drip irrigation. What are the benefits of the Conserved Water Program? The program promotes the conservation of water, maximizes the beneficial use of water, and enhances streamflows by requiring that at least 25% of water saved by a water conservation project be protected permanently instream. How is the conserved water allocated? The state receives 25% and the applicant receives 75% of the conserved water unless the applicant proposes a higher allocation to the state. Most DRC funded projects allocate 100% to the state for instream use. Will my water right be affected by the allocation of conserved water? Your new water right will show the changes made for the conserved water. The water right retains its original priority date or can be one minute after that of the original right. If my original water right is for irrigation, can I use the conserved water for another use? Yes, as long as the new use is identified as a beneficial use. Keep in mind that surface water rights for irrigation will always be limited to the irrigation season identified in the original right. How do I apply for the conserved water program? Application forms are available at www.oregon.gov/owrd. Who owns the water in Oregon? Under Oregon law, all water is publicly owned. With some exceptions, cities, farmers, factory owners, and other water users must obtain a permit or water right from the Oregon Water Resources Department to use water from any source— whether it is underground, or from lakes or streams. Generally speaking, landowners with water flowing past, through, or under their property do not automatically have the right to use that water without a permit from the Oregon Water Resources Department. What is a beneficial use of water? It depends on what your water right is. Some examples are agriculture, stock water, industrial, commercial, aquatic life, and nursery operations. Who do I contact to learn more about my water rights? The Oregon Water Resources Department. Deschutes Basin Watermaster (541) 388-6669. OWRD in Salem (503) 986-4700. How do I know how much water I am entitled to and when I am allowed to use it? Your water right certificate will often give you the information you need to know. Contact the Oregon Water Resources Dept. if you do not know if you have a certificate. Do I need a water right for my livestock? Stock watering is an exempt use from groundwater. If stock drinks directly from a surface water source, then the user is also exempt. Do I need a water right for my pond? Most often yes, unless you use the pond for irrigation and you already have an irrigation water right. If the pond is not used for irrigation, you may need a water right for storage or a multipurpose right. Can I divert water from the stream/ditch/canal that runs behind my house? Not without a water right. Who enforces Oregon’s water laws? The primary enforcers are state watermasters from the Oregon Water Resources Department. What if I have a water right and I use only part of it or none of it? You can lease all or part of your water right instream either temporarily or permanently to avoid forfeiture. Each year of leasing instream counts as a year of beneficial use. This allows you to protect your water rights that are not being used while providing instream benefits. Contact the Deschutes River Conservancy for more information (541) 382-4077 ext.16. Do I need a water right to pump groundwater out of the well on my property? Yes, unless it falls under exempt uses such as domestic, stock watering, lawn or a noncommercial garden less than .5 acre in area. How can I get information on my well? You can look up your well online at www.oregon.gov/owrd. You will need the legal description of your property (i.e. township, range, section, quarter section, and tax lot). You can also call the Oregon Water Resources Department. When is the irrigation season? The irrigation season typically runs from April 1st until November 1st but can vary depending on the district and water availability. Check with your irrigation district or watermaster for dates. How do I know what irrigation district I’m in? Call the Oregon Water Resources Department. Why am I not getting all my water? If you receive water through an Irrigation District, flows will gradually increase (ramp up) at the beginning of the season and ramp down toward the end of the season. Full flows are generally available from mid-May through mid-September. If your property lies outside of an irrigation district, your water availability is dependent on your priority date and the stream’s supply. Instream leasing refers to the temporary transfer of a water right to protect instream flows. The landowner (water right holder) retains ownership of the actual water right while the DRC (or other organization) obtains use of the water for a specified period of time. Landowners may donate their water or are paid for each acre of water leased for temporarily leaving their water instream. What is the benefit of leasing my water right instream? You need to beneficially use your water once every five years to maintain your water right. Each year of leasing instream protects your water right while simultaneously providing benefits to rivers and streams and counting as a beneficial use. How do rivers and streams benefit from instream leasing? Prior to 1987, Oregon did not consider water instream to be a beneficial use. Today we realize that if fish and wildlife benefit, the public also benefits. Other benefits include recreation, water quality, navigation, and conservation of aquatic life. How long does an instream lease last? Water can be leased for one to five years, but cannot exceed five years except by renewal. If you are interested in leasing longer than five years, contact the Deschutes River Conservancy for more information. Can I lease a portion of my water right? Yes. You may lease all or part of your water right to instream use. You are also allowed a split season lease so that you may apply water for part of the season and then lease the water instream for the remainder of the season. Can instream rights take water away from existing users? It depends. Instream rights hold the same priority date as the original water right. They must yield to senior users, but have priority over junior users.